The She wee is one of the most popular brands of female urination aids. Basically, it allows someone to pee while standing up. When Can I Use the She Wee? For long distance truckers, pilots, etc. 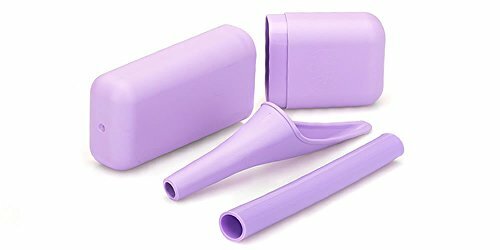 For more details about this female urination device, you’ll want to check out this article: Shewee Review. Let’s get into the details about how to use the Shewee so you don’t get pee all over your pants, legs or shoes! A quick tip before we get started. It’s strongly recommended that you practice in the shower with a pee funnel first. There is certainly a learning curve to using one, so do this first to prevent disaster. Undo your pants, and push your underwear to the side. Place the She Wee against your body (gently). The pointy end should be touching your body, but the front rounded end should not (it should be a few mm away). This will ensure that the She wee does not overflow. Aim the Shewee away from your feet, and remember gravity (the tube should be pointed down). Pee, and that’s about it! The surface of the She Wee is water repellant and shouldn’t require much in the way of care. Put the She Wee back in the case. Want to pee in the car with the SheWee while driving? You can find out more here: How to Pee While Driving with a Pee Funnel. I want to Buy the She Wee! The Shewee is the female urination device for you? We LOVE it. It’s a top-quality device at a very reasonable price. It also works better than much of their competition, which will leave you without pee all over your legs or shoes. Another thing we love is that the She Wee allows you to pee without pulling down your underwear, unlike many other similar devices. You just have to push them to the side. The company has been around for years, and there are hundreds of excellent customer reviews on Amazon. This is usually a great indication of a product that actually works. How to Use the She Wee: Any Tips? Do you have any tips or advice you’d like to share with us about using the She Wee? Leave a comment below and let us know.